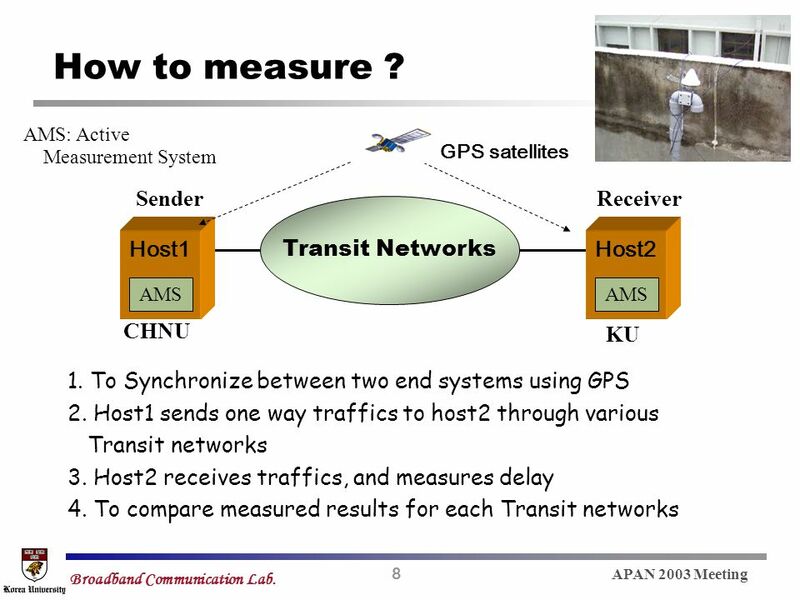 APAN 2003 Meeting Broadband Communication Lab. 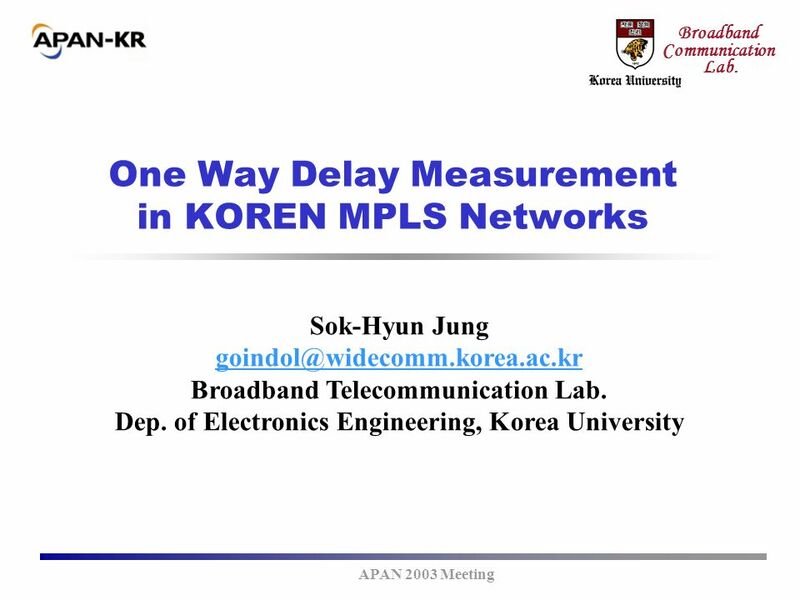 One Way Delay Measurement in KOREN MPLS Networks Sok-Hyun Jung Broadband Telecommunication. 4 4 APAN 2003 Meeting Broadband Communication Lab. 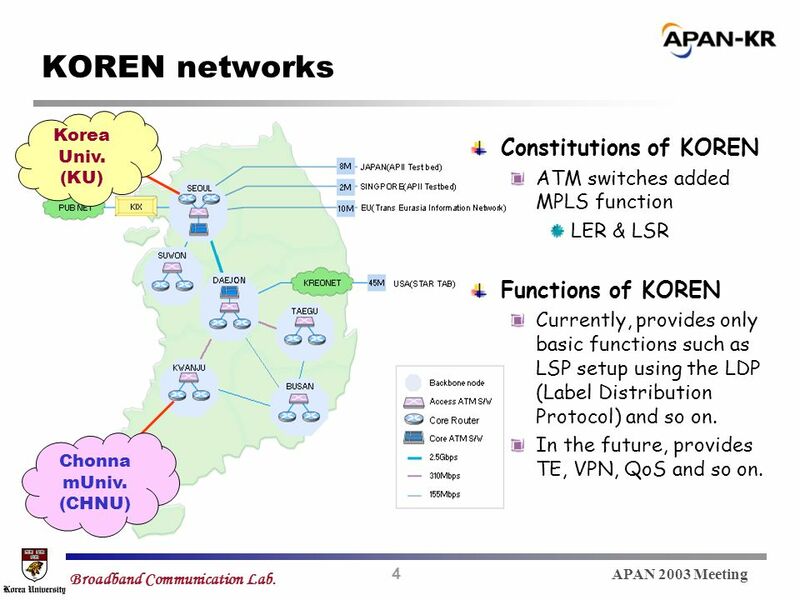 KOREN networks Korea Univ. (KU) Chonna mUniv. 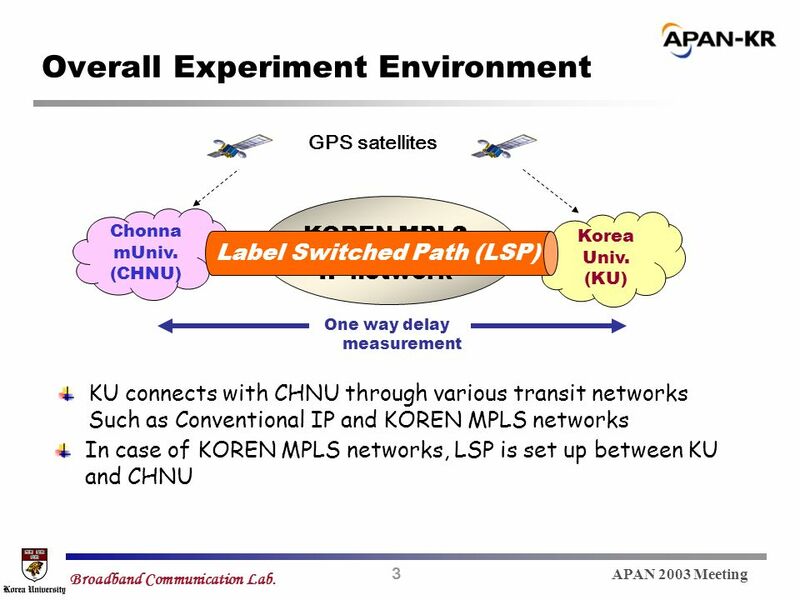 (CHNU) Constitutions of KOREN ATM switches added MPLS function LER & LSR Functions of KOREN Currently, provides only basic functions such as LSP setup using the LDP (Label Distribution Protocol) and so on. In the future, provides TE, VPN, QoS and so on. 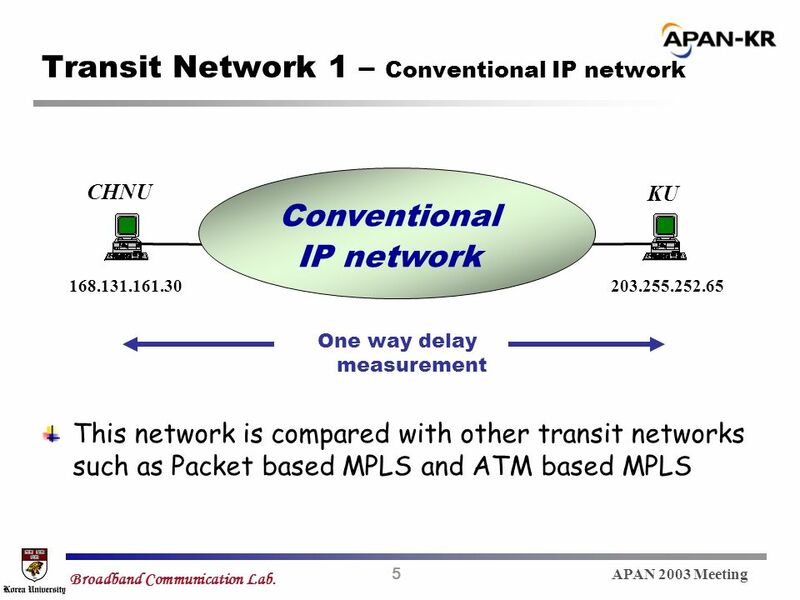 13 13 APAN 2003 Meeting Broadband Communication Lab. Thank you for your attention !! Thank you for your attention !! 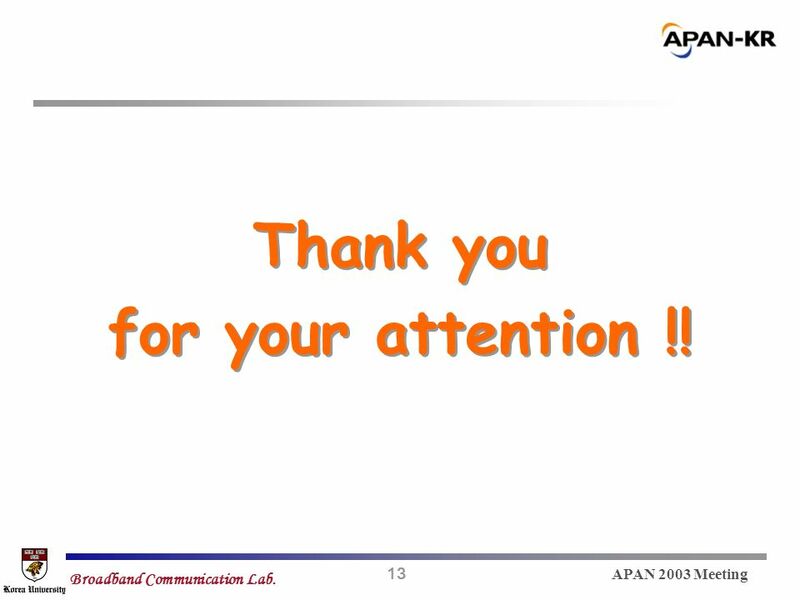 Download ppt "APAN 2003 Meeting Broadband Communication Lab. 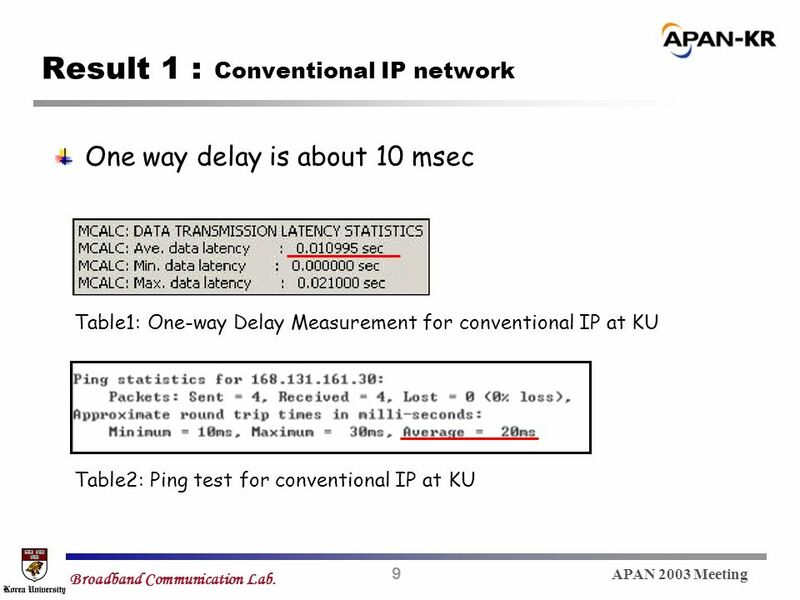 One Way Delay Measurement in KOREN MPLS Networks Sok-Hyun Jung Broadband Telecommunication." 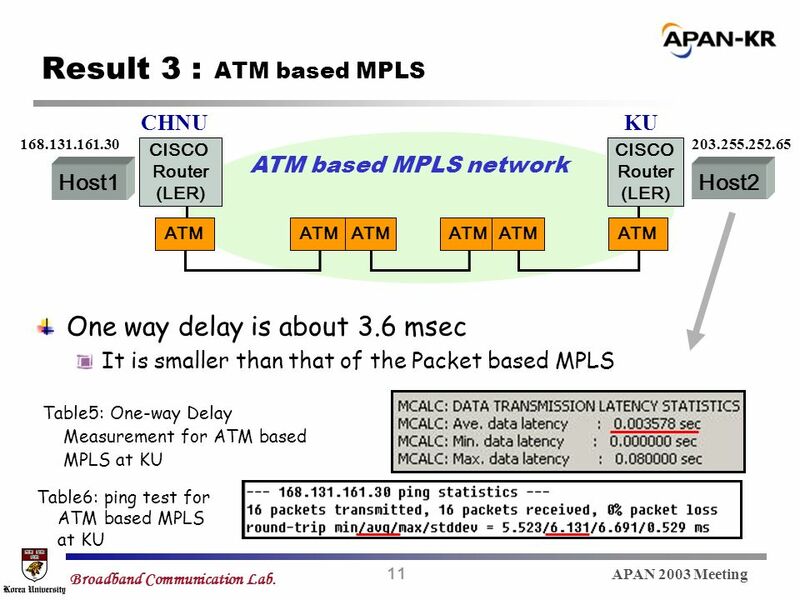 QoS Strategy in DiffServ aware MPLS environment Teerapat Sanguankotchakorn, D.Eng. Telecommunications Program, School of Advanced Technologies Asian Institute. 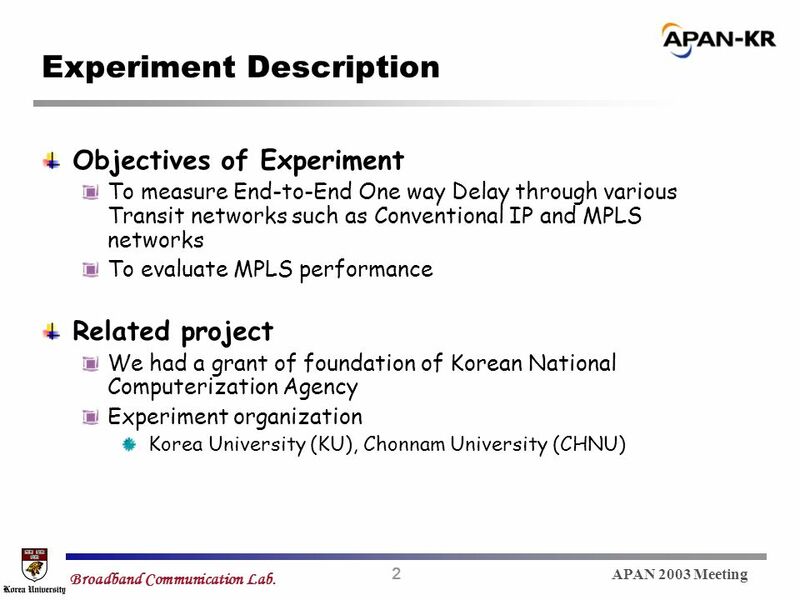 Object-Oriented Design and Implementation of Fault Management Function for MPLS network Sung-Jin Lim, Ryung-Min Kim, and Young-Tak Kim Advanced Networking. Design and Implementation of Performance Management for the DiffServ-aware-MPLS Network Dong-Jin Shin, Young-Tak Kim Advanced Networking Technology Lab.(ANT. © 2006 Cisco Systems, Inc. All rights reserved. 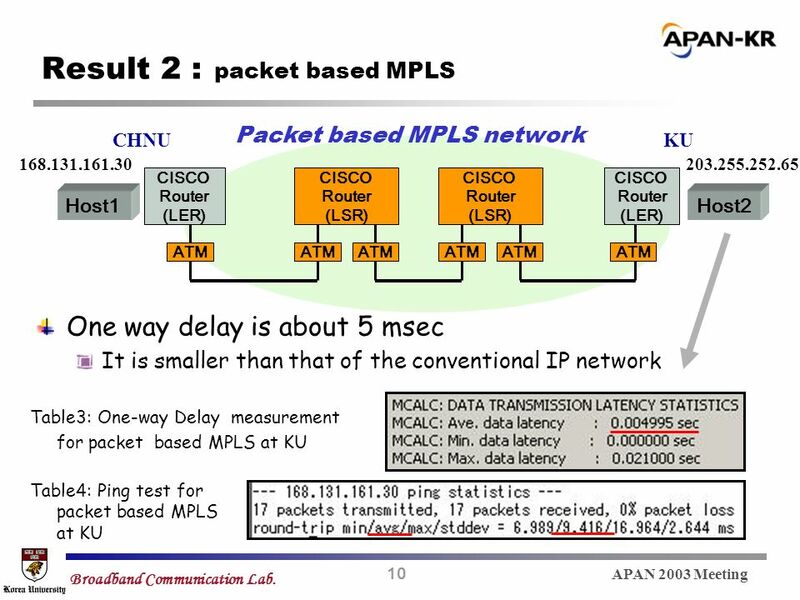 MPLS v Frame-Mode MPLS Implementation on Cisco IOS Platforms Troubleshooting Frame-Mode MPLS on Cisco. © 2006 Cisco Systems, Inc. All rights reserved. 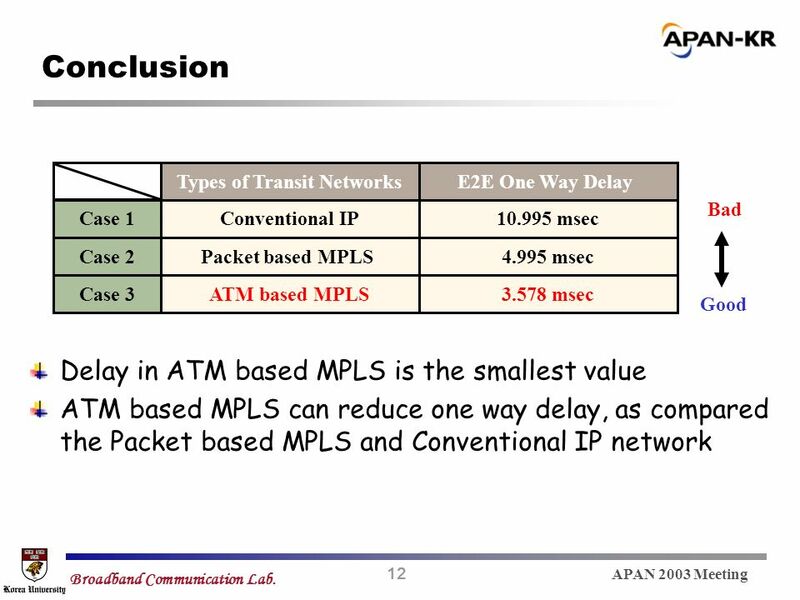 MPLS v2.2—8-1 MPLS TE Overview Introducing the TE Concept. © 2006 Cisco Systems, Inc. All rights reserved. 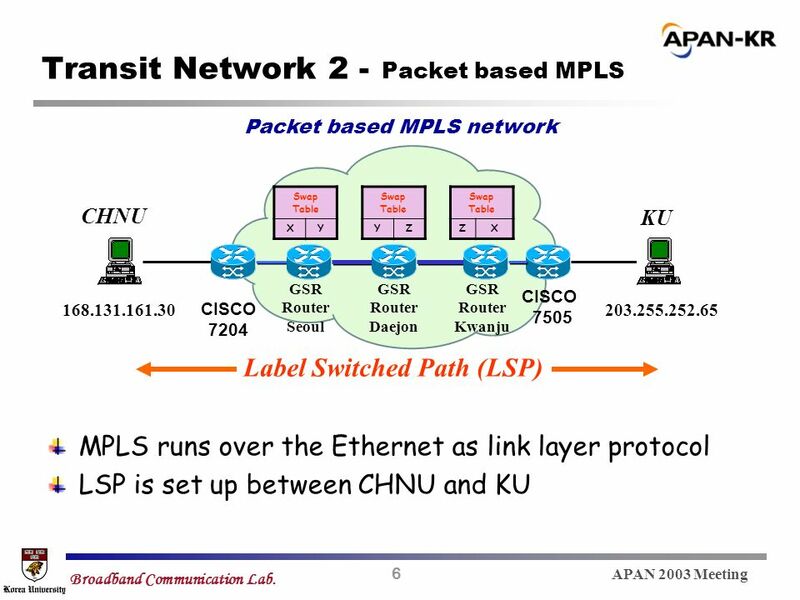 MPLS v2.2—2-1 Label Assignment and Distribution Introducing Convergence in Frame-Mode MPLS. © 2006 Cisco Systems, Inc. All rights reserved. MPLS v2.2—2-1 Label Assignment and Distribution Introducing Typical Label Distribution in Frame-Mode MPLS. MPLS: The Magic Behind the Myths Grenville Armitage Lucent Technologies.